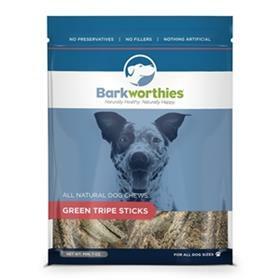 Loaded with essential nutrients, Barkworthies Green Beef Tripe Sticks are among the healthiest, most nutritious dog treats available. These treats are an amazing cleaner for teeth and great for maintaining overall skin and coat condition. Each irresistibly chewy stick measures approximately 5 to 7 inches in length and varies in thickness. As with all of our products, our Green Beef Tripe Sticks are additive-free, chemical-free and preservative-free. Moreover, most Barkworthies products are single-ingredient chews, making them 100% healthy and safe.